A bit over a year ago, Saudi Arabia declared war on the U.S. oil industry. This week brought new signs that the Saudis might at last be winning. At first, it looked like the strategy was failing. The flood of crude successfully drove down prices, and U.S. producers cut back on drilling in response. But the wells they did drill were so successful that total production barely budged. And when prices rebounded even a bit, as they did briefly last spring, U.S. producers went right back to drilling, pushing prices back down. The money crunch is hitting just as U.S. production is starting to decline. On Tuesday, the Energy Information Administration estimated that production is down 600,000 barrels per day since April; the agency expects production to fall at least that much again by the end of the year. Without a cash infusion, those declines will only accelerate. 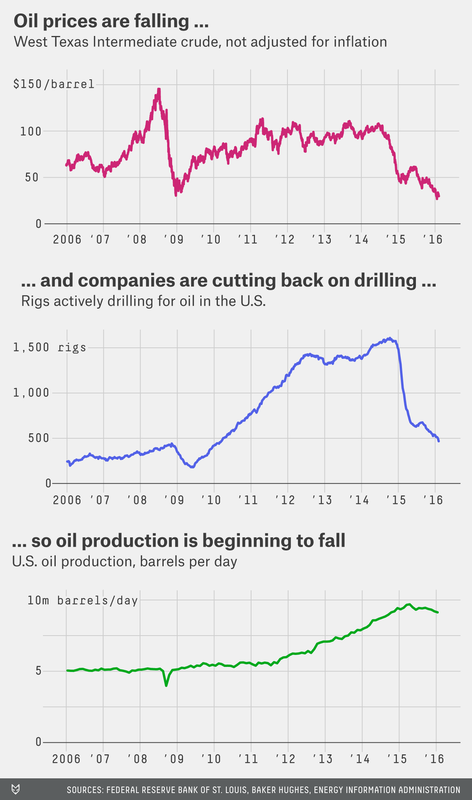 If production is falling, does that mean oil prices are going to go back up? Maybe. A popular argument in the oil patch is that the pullback in investment is sowing the seeds for the next surge in prices; oil companies won’t be able to boost production quickly enough when it’s needed, leading to higher prices. But even if that argument is right, it could take years for such a rebalancing to occur. And besides, as I’ve argued before, the conventional wisdom on oil is (almost) always wrong. President Obama released the final budget of his presidency this week, and Republicans in Congress rejected it before the White House even presented it to them. House Ways and Means Chairman Kevin Brady called the budget a “waste of time,” which was harsh but not precisely wrong — Obama has about as much chance of getting his budget through Congress as Jim Gilmore does of becoming president. So instead of thinking of the document as a “budget” in the traditional sense, think of it as Obama’s attempt to set the Democratic Party agenda in a year when other members of his party are getting most of the attention. The price tag for all this (it is a budget, after all): $4.1 trillion, nearly three-quarters of which is mandatory spending on Social Security, Medicare, Medicaid and interest on the debt. The White House says that under its budget, the deficit would be smaller as a share of the economy in 2017 than in 2016 — 2.6 percent, down from 3.3 percent — and would stay below 3 percent for the next decade. The nonpartisan Congressional Budget Office is less sanguine: In a report released last month (which was based on its own spending projections, not Obama’s budget), CBO analysts estimated that the deficit would hit 3.5 percent of GDP in 2019 and grow from there. Last week’s jobs report was a mild disappointment, but it offered no hint that the slowing global economy is dragging the U.S. toward another recession. In congressional testimony Wednesday, Federal Reserve Chairwoman Janet Yellen said she, too, saw little evidence of a slowdown in the economy — at least not yet. But she suggested that “the balance of risks” has shifted toward the negative; translated from Fedspeak to English, that means that the economy is more likely to get worse than to get better. The unemployment rate has fallen below 5 percent for the first time since 2008. But don’t tell that to Donald Trump. In his victory speech after Tuesday night’s New Hampshire primary, the pugnacious billionaire said the real unemployment rate is as high as 42 percent. Trump has made the claim before, and plenty of journalists have soberly pointed out why he’s full of it. Trump’s calculation, if you can call it that, presumes that the unemployment rate should count every adult who isn’t working, no matter their age, disability or other extenuating circumstances. By that definition, the unemployment rate hasn’t dropped below 35 percent since at least World War II. More than 3 million Americans quit their jobs in December, the most since 2006 and an absurd 6.8 percent increase from November. The huge jump, as reported in the monthly Job Openings and Labor Turnover Survey (known to econ nerds as JOLTS), could well be a fluke, but the trend has been strongly upward for several months now. That’s good news. Voluntary quits are a sign of confidence in the economy; workers don’t usually walk out of a secure job if they aren’t confident they can get another one (or, often, without already having one in hand). Changing jobs is also an important way for workers to get raises and has the added benefit of opening up opportunities for other employees to move up the ranks or for unemployed workers to fill the newly open jobs. Both quits and job turnover more generally were slow to rebound after the recession; the recent pickup is a welcome sign of strength. Allison Schrager looks at rich countries’ looming demographic time bomb. Dallas Mavericks owner Mark Cuban blogs about the decline in initial public offerings and why it’s bad for the economy. The Economist reports on efforts to reform Argentina’s beleaguered statistical agency.